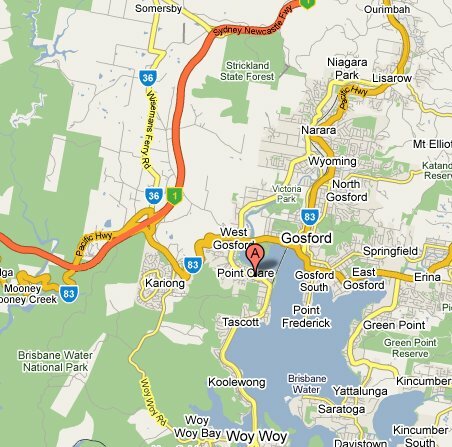 Travelling from Gosford: Get onto the Central Coast Highway (via Brian McGowan Bridge from East Gosford or via Donnison St & Riou St if coming from the centre of Gosford). After 1.8 km, turn left at Brisbane Water Drive. Proceed 1.6 km (past the West Gosford shops, the Ambulance Station, Fairhaven School and the pedestrian traffic lights on the straight). 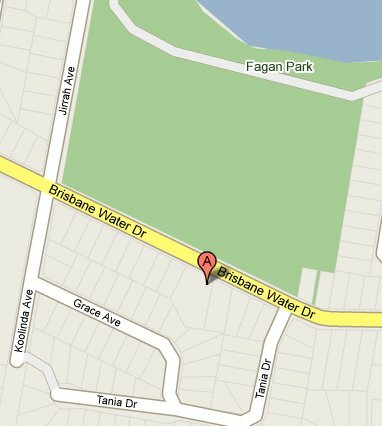 Our driveway is on the right, directly opposite the bus shed at the far end of Fagan Park. Travelling from Woy Woy: From Woy Woy railway station, the distance is 6.7 km along Brisbane Water Drive. Drive through Koolewong and Tascott, over the railway line, right at the roundabout, continue past Point Clare railway station (on the right) and the school (on the left). Continue over the hill and just as the straight comes into view, our driveway is on the left, directly opposite the bus shed at the near end of Fagan Park.